Thirty years ago Tim Burton gave us the gift of Beetlejuice. A cinematic classic that happens to be one of those movies you can watch over and over “and it keeps getting funnier every single time” you see it. 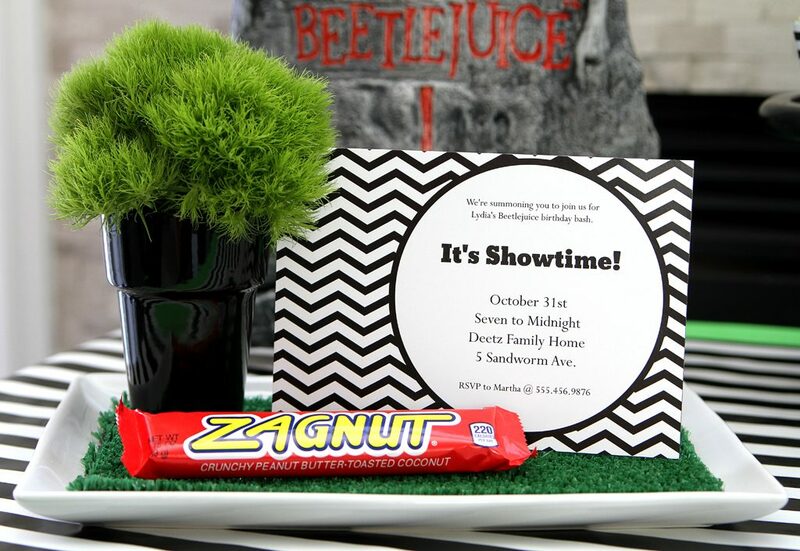 In honor of three decades of replays, we planned a Beetlejuice Halloween Party. 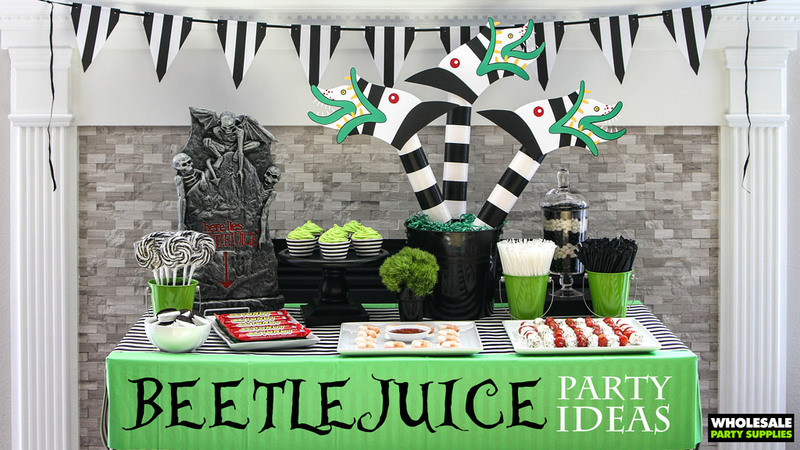 No need to visit the Netherworld for Beetlejuice party ideas, we’ve gathered an inspiring collection right here in this life. Even though we’re living, you can trust us! 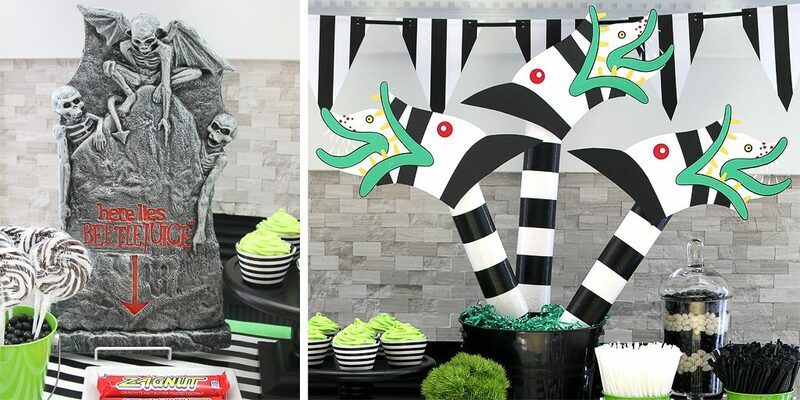 Start the party off by inviting guests with these Black and White Chevron Personalized Invitations that subtly mimic Beetlejuice’s iconic striped suit. Since the house plays an important role in the movie, why not use yours as part of the decorations? A mantle or staircase as the party’s backdrop will definitely pay homage to a few memorable film scenes. 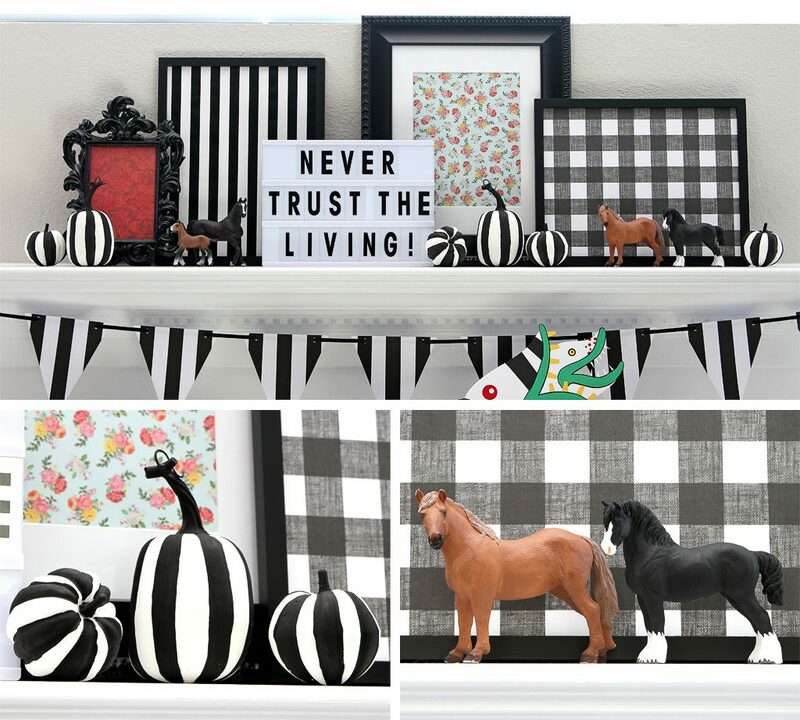 Fill Black Frames with pattern paper that represent the main characters: a red damask for Lydia, a delicate floral print for Barbara, a buffalo plaid for Adam and, of course, black and white stripes for the “ghost with the most, babe”. Use a Lighted Message Box to showcase a movie quote. Hand-painted pumpkins bring in a subtle Halloween element. Horse figurines? Watch the movie to catch this reference : ). Make sure the food table gets Beetlejuiced. 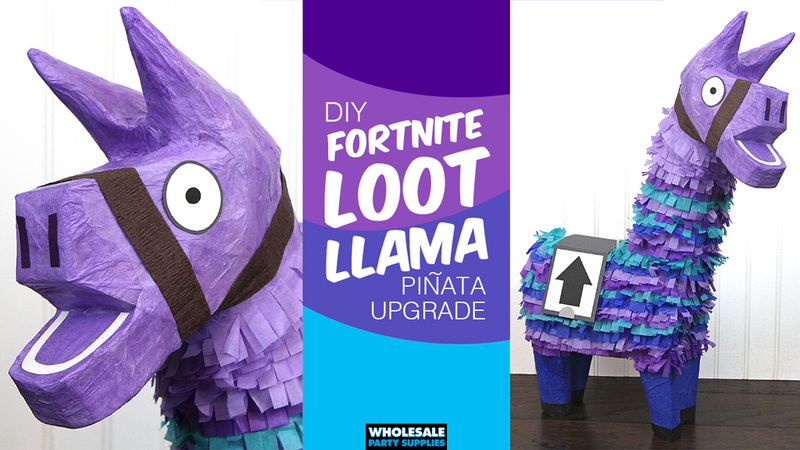 It’s easy with these themed decorations. On one side of the table, we set up a Beetlejuice Tombstone and strategically pointed the arrow to one of our sweet treat offerings. The other side of the table got this DIY Sandworm Centerpiece which definitely gives an impactful thematic reference. Could there be too many black and white stripes? 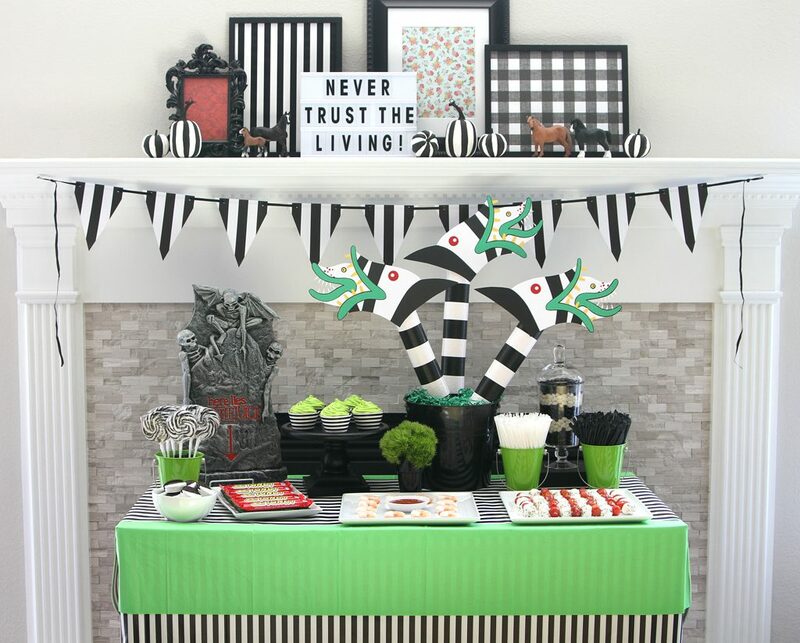 We don’t think so … especially for a truly iconic Beetlejuice party. 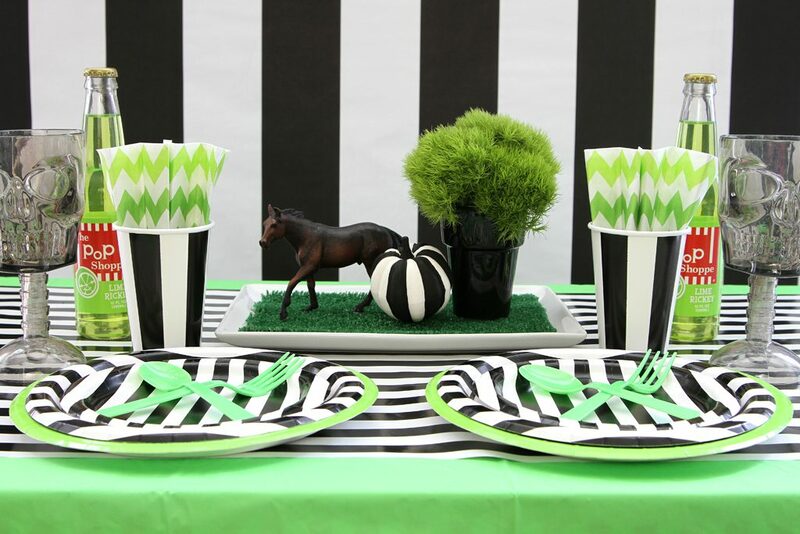 Layer all the Black and White Stripe Tableware you can then add touches of lime green plates, table cover and cutlery to make the stripes pop even more (as well as to mimic Beetlejuice’s moldy hair). These Skull Goblets are a whimsical way to include an eerie element to the place setting. 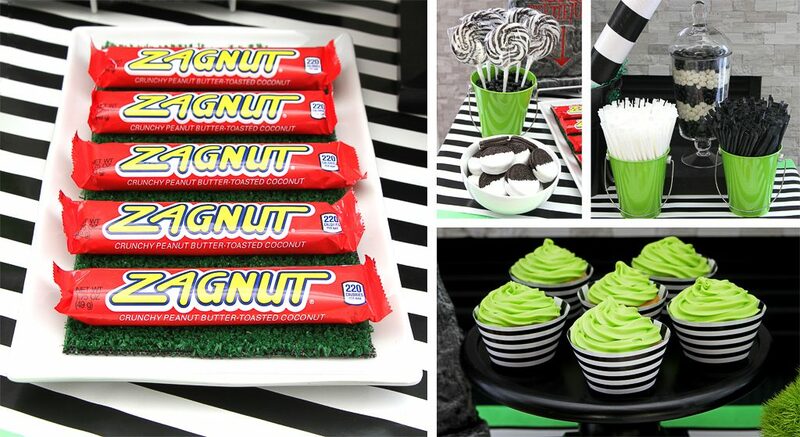 Zagnut candy bars. They are a must. We set ours atop a piece of artificial turf … one more way to reference a memorable movie scene. Offer guests numerous black and white sweets including Black Swirl Lollipops, dipped Oreos, Candy Straws and Jelly Beans. 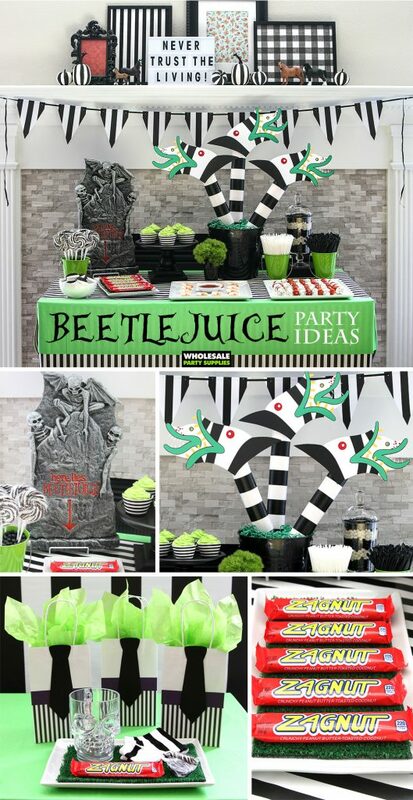 Fill Black White Striped Reversible Wrappers with cupcakes frosted in neon green icing … another subtle reference to Beetlejuice’s moldy head of hair. For the savory portion of the menu, shrimp is another must have. 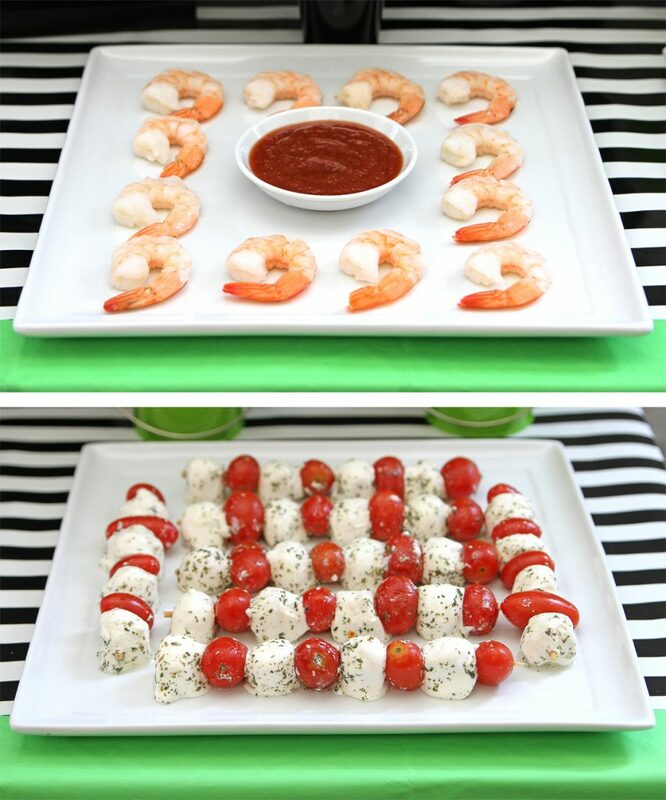 Pair it with some Caprese kabobs for a light and refreshing side dish choice. 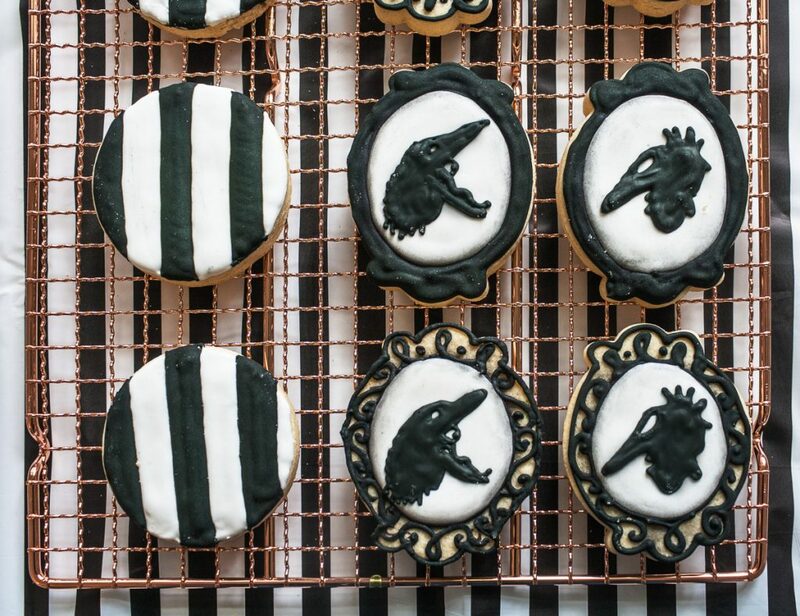 For dessert, these cameo cookies in the style of the Maitland’s haunting faces will satisfy even the most spirited sweet tooth. Guest always enjoy a fun photo booth opportunity. 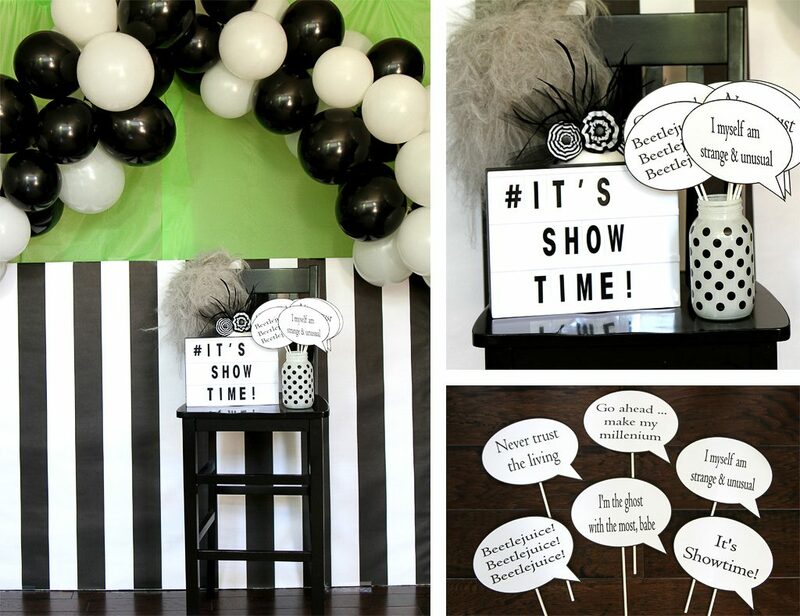 Provide them with a soaring black and white balloon arch, some famous quote props and a Beetlejuice Wig for the full “Showtime” experience. 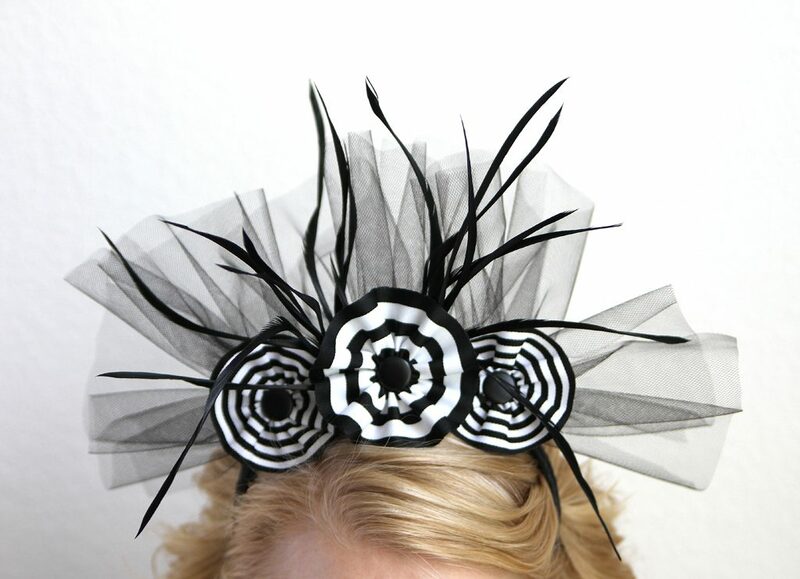 You could also set out this DIY Black and White Halloween Headband for those who’d rather take a wigless pic. 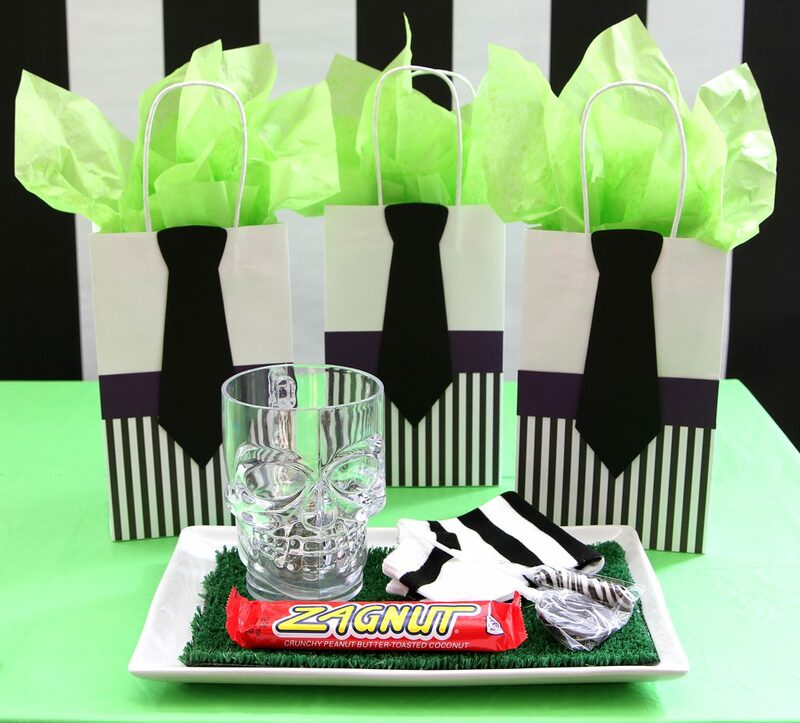 When it’s time to return to the land of the living, send guests off on their journey with these Beetlejuice inspired favor bags. We covered White Handled Favor Bags with striped pattern paper then added a cardstock tie and “belt”. Green Tissue Paper once again references moldy hair and keeps all the goodies inside. We filled the bags with a Skull Mug, a pair of black and white striped socks, a few Black and White Lollipops and of course, a Zagnut bar.